HONOLULU—A new, high-end LED video wall from Sansi North America (SNA) Displays is the visual centerpiece of the newly renovated Bank of Hawaii main branch location in downtown Honolulu. 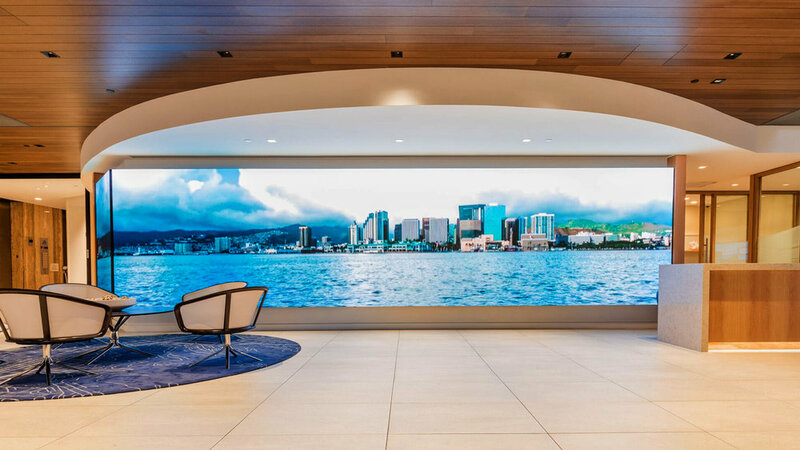 The digital wall, a cutting-edge FINE PITCH Interior S|VideoTM LED display with more than 2.4 million pixels, was designed into the sleek new lobby space as part of the bank’s “Branch of Tomorrow,” 21-century banking experience makeover. Other renovations to the bank’s main branch included a sprawling, open floor plan, private transaction rooms, floor-to-ceiling modern finishes, contemporary furnishings, upgraded easy-deposit ATMs and tablets for more personal interactions and great convenience. The vibrant lobby video wall spans the length of the bank’s entrance-facing wall, greeting customers with striking visuals. The display’s content rotates through bold, colorful imagery drawn from themes of the Hawaiian voyaging canoe. The screen also serves as a state-of-the-art canvas for showcasing bank promotions and other marketing campaigns. Measuring 33 feet long and seven feet high, the modern screen features a 3 mm pixel pitch, meaning the center of each pixel is just 3 millimeters (.19 inches) from the center of an adjacent pixel. With almost two and a half million pixels (720 high x 3,360 wide), the LED video wall is capable of displaying high-resolution video and images. SNA Displays partnered with Ford AV, one of the leading commercial AV integrators in the U.S., to install and integrate 14 large subframe assemblies into one beautiful LED canvas. For additional photos and information, visit the SNA Displays Bank of Hawaii project page. Ford AV designs, installs, and manages complex AV and lighting systems in a variety of verticals and is a member of SNA Displays’ channel program, a mutually beneficial partnership between SNA Displays and best-in-breed integrators, specialists, consultants and other value-added solutions partners. Project management teams from both SNA Displays and Ford AV coordinated on the Bank of Hawaii project onsite. The project crews installed the lobby display in only two and a half days. Rick Bortles, vice president of SNA Displays’ Channel Program, said partners like Ford AV are driving unprecedented growth in various markets for the company. SNA Displays’ attention to detail, quality control and teamwork was appreciated by the Ford AV crew. Ford AV designs, installs, rents and services professional sound, video and lighting systems for education, corporate, government, houses of worship, entertainment and sporting venues. Established in 1973, Ford employs more than 470 with offices across the United States. Recognized as one of the top audio-video integrators in the nation, Ford is known for installing some of the largest and most complex AV projects including ExxonMobil, AT&T, Houston Intercontinental Airport, State Farm, Fannie Mae, Apple Headquarters, Denver International Airport, Broncos Stadium, U.S. House of Representatives, West Angeles Church of God and the Cyber Warfare Integration Center for the U.S. Military. Visit Ford AV at www.fordav.com.